Another Option: For private tours of Normandy, you may also take the fast trains to and from Caen. 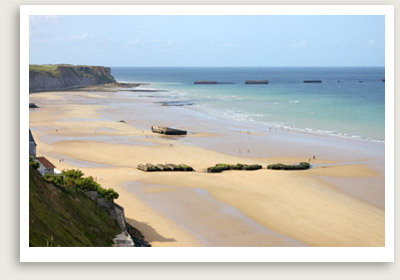 Private tours are also available starting in Normandy. We may all the arrangements. Caen Private Tour Includes: Your Falaise and Caen private tour includes transportation, guide service, entrance tickets to the Peace Memorial in Caen and the castle in Falaise. Your guided tour of Normandy begins in Caen, where WWII meets William the Conqueror. Caen is known for its historical buildings built during the reign of William the Conqueror, who was buried here, and the heavy battles that took place here in 1944, destroying much of the town. You will enjoy a short driving tour of Caen, including its huge medieval fortress, an 11th century castle built by William the Conqueror and the Men’s abbey where William the Conqueror is buried. Your Normandy tour also includes a visit to the Caen Peace Memorial. This monument and museum to peace depicts both the devastation of war and the global quest for peace in its many forms. After the Caen private tour in Normandy, you continue on to Falaise, the birthplace of William the Conqueror. Your guide will take you on a tour of the restored castle here where he was born to the Duke’s mistress, a tanner’s daughter. While the many buildings originally making up the castle have largely been destroyed, a creative restoration brings its history back to life through imaginative interactive displays. Your Normandy tour will also take you to see where the famous battle of Normandy (Battle of the Gap) ended.